1Department of Pharmaceutical Biotechnology, JSS College of Pharmacy, Ootacamund Tamil nadu 643001, INDIA. 2Department of Pharmaceutical Chemistry, Bharat Institute of Technology, Ranga Reddy District, Telangana 501510, INDIA. Background: Cancer is one of the leading causes of death and globally the numbers of cases of cancer are increasing gradually. However, surgeries, chemotherapies have become safer, but these treatments have debilitating side effects. Flavonoids present in the human diet comprise many polyphenolic secondary metabolites with broad-spectrum pharmacological activities including their potential role as anti-cancer agents. Objective: The objective of the present study was to extract, orange peel flavonoids (Orange Peel Extract) and to screen anticancer potential of OPF. Methods: In the present study tryphan blue dye exclusion, clonogenic assay and nuclear damage studies by ethidium bromide staining were performed to estimate in vitro antitumor properties of Orange Peel Extract and subsequently in vivo studies also performed using the Dalton lymphoma ascites (DLA) tumor model in Swiss albino mice. 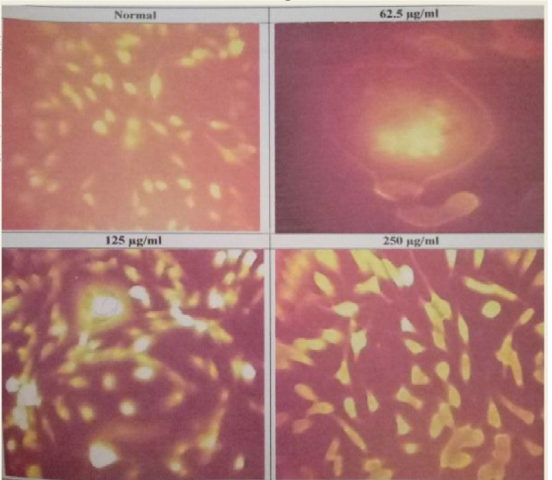 Results: In vitro studies revealed the moderate toxicity, high regenerative capacity of Orange Peel Extract and also showed changes in nuclear morphology similar to that of apoptotic cells which is one of the important aspect of an anticancer drug. In vivo studies confirmed the anticancer activity of Orange Peel Extract and has increased the average life span of treated animals and restored the antioxidant enzyme levels and hematological parameters to normal which was comparable to that of standard methotrexate. Conclusion: Overall, these findings have proved that out of the two doses (50mg/kg bw and 200mg/kg bw) employed for the study lower dose (50mg/kg) was found to be more effective than higher dose (200mg/ kg). Hence flavonoid fraction of orange peels can be the better alternative to treat cancer. Shirisha G, Mandava K, Batchu UR, Thammana KR, Turpu VL. Antitumor and Antioxidant Effects of Flavonoid Fraction of Citrus sinensis peel Extract. Pharmacognosy Journal. 2019;11(1):57-63.